The "Green Flame" Range by American Range is perfect for churches, retirement homes and fire stations. It is designed for short time period everyday use and/or usage for only a few days a week. All Stainless Steel external body is a standard fixture for long service life and easy cleaning. All the latest design and manufacturing technology is incorporated in this range to give you the best energy efficiency, quality and dependability. 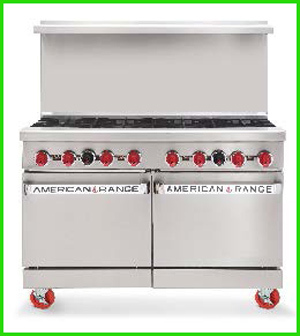 Customer satisfaction makes American Range the ultimate choice. No standing pilots. Made possible with PBIS technology (pilotless burner ignition system). 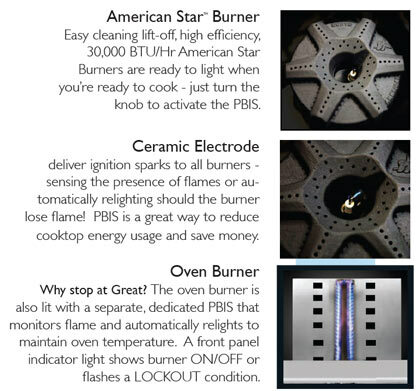 Electronic on-demand ignition for gas burners (PBIS). Electronic ignition for bake burner (PBIS). Requires 120 volt connection for electronic ignition system. One Year Warranty. Full parts and labor.